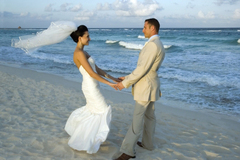 I provide wedding vows and offer local information help. Attend rehearsals and officiate. I complete the marriage license and mail the two copies for probate courts and return one copy for the couple. Barbara was professional, experienced and a wonderful addition to our ceremony. She knew exactly what to do and when to do it. She was also fine with us writing our own vows. She also provided vows for us to use.